I've had a great few weeks training in San Francisco working on heavy air board handling and technique. The time has been really productive in developing more confidence in big breeze and getting valuable water time applying techniques to improve consistency of speed and control over chop. The weeks culminated in a local regatta that is one of the most unique events I've ever participated in. Held at the St. Francis Yacht Club, the San Francisco Classic / UltraNectar Challenge is a distance race that spans the San Francisco Bay west to east from the Golden Gate Bridge to Berkeley. Sailors have to get all the way down to Berkeley after racing a two-lap triangle, and they have to do it via a giant slalom that spans the entire width of the bay. This is the "San Francisco Classic" portion of the race. After the downwind giant slalom, the objective of the second half of the race (the UltraNectar Challenge) is to get back upwind to a finish line at the St. Francis Yacht Club. San Francisco rolled out some classic conditions for the distance race. The wind was about 15-25 and we began the race in foggy, cold weather. Since the tide was flooding, the chop wasn't too bad and getting downwind was really fast. I really enjoyed the aggressive reaches across the bay and was able to hang with some of the kiters going downwind. Being on the RS:X required a bit more patience, as I was a good deal slower than the Formula boards. It was a good thing the sky was full of brightly-colored kites to mark the way around the somewhat complicated course! Going back upwind was a bit more difficult against the relatively strong current, which maxed at about 3 .2 knots that day. 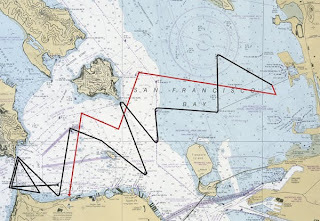 I planned a route in advance by looking at the tide charts and tacked up the side of Angel Island on the north side of the bay. I managed to stay with the same group of kiters; however, I got too enthusiastic about staying out of the current and sailed into a hole on the west side of the island, losing a few of the kites. Sunday's racing was normal course racing, normal except that during the last two races the committee combined the windsurfers' start with the kites. Local Formula sailor Seth Besse's advice about the start was to just ignore the kites and start as usual. It's a little concerning when you as a windsurfer can't see the kite lines, but the kite sailors have good visibility and spatial awareness of their equipment. I really enjoyed racing with the kiteboards and seeing their abilities and tactics. The St. Francis Yacht Club made yet another progressive decision when beginning the kiteboard series and combining it with the windsurfing events. I've never seen a closer and more understanding relationship between kiters and windsurfers than in San Francisco. The forward-thinking attitude towards pushing new improvements and working together in both sports has created a fun and unique community, which is the way both watersports should ideally interact. I am excited to return to San Francisco in September to reinforce some techniques and board handling before the Pan Am Games in Puerto Vallarta, Mexico, this October. I am now en route to Weymouth, UK, where I will be training prior to the Pre-Olympic Test Event, beginning in early August. I'm looking forward to getting some good time on the water with quality training partners and continuing my adventures on the road to the 2012 Olympics. Check out some of the action from the Bic Techno training camp in San Francisco. I'm not the best creator of videos, but this captures some good moments. USA Bic Techno Fleet gets ready for the 2011 Techno Worlds! 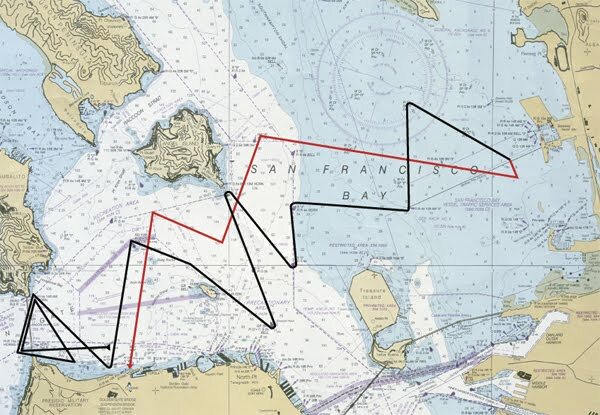 On July 17-24, more than 200 kids from 30 countries and 5 continents will descend on San Francisco Bay for the 2011 Bic Techno one-design World Championships, held at the St. Francis Yacht Club near the Golden Gate Bridge. The regatta is a big moment for the USA's windsurfing program, as it will provide a boost to our fledgling junior development program. The windy and rough conditions and dramatic scenery of San Francisco Bay will be an unparalleled experience for most sailors attending, including some of the USA's youth sailors from the East Coast. Under the leadership of youth coach Britt Viehman, I assisted in coaching a Bic Techno clinic last week for American kids competing at the Worlds. Nine kids showed up, from both San Francisco and Florida. We had abilities ranging from fairly advanced to beginner, which is a typical skill range for American youth sailors. Each group of youth learned something new by participating in the training camp. Sailors from Florida were wide-eyed after the first day of training in San Francisco. For many of them, it was the coldest and windiest conditions they had ever experienced. These sailors focused on planing technique up and downwind, tacks, jibes, and planing starts. A major factor contributing to the success of their training was developing confidence in the rough conditions. A few sailors spent time learning to make confident, fast runs upwind and downwind in a straight line, and develop sail handling techniques in windy conditions. The local kids already had a good grip on the usual conditions, but what they didn't initially understand was the concept of sailing teamwork. For a few, it was the first time experiencing coaching on a schedule, two sessions a day, with a debrief after sailing. By the end of the camp, they were better about being on the water on time and keeping together in a group for drills to learn from each other. All the kids tuned up their equipment in the breeze, and learned more about San Francisco's famous currents - how to start in big current, and which side of the course would be favored by observing the action of the current in various stages of ebb and flood tides. The only major flaw in the training camp is that it was too short as time and funding are limited at this point. The kids really needed a few weeks at this venue to further develop skills and confidence. However, the stoke was high as everyone is looking forward to returning to the City by the Bay and the Bic Techno Worlds.